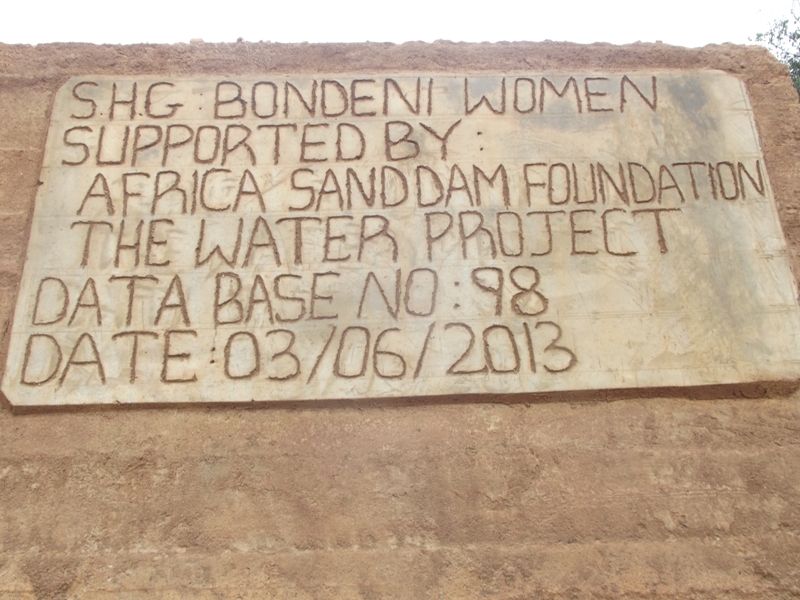 This project is being implemented by our partner, African Sand Dam Foundation, and includes the construction of a sand dam. The group was formed in the year 2011. It has a membership of 32 women. 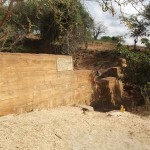 The group is found in Muthingiini sub-location of Nzambani location. The reasons that lead to formation included soil conservation through terracing their farms and merry go round which would help them to uplift their living standards. Agriculture is the main form of livelihoods in the area and a majority of the community also depend on livestock keeping for income generation. This is because of the changes in climate that have resulted to poor yields from the farms. Farmers keep the livestock so as to be able to dispose them during the dry periods to get income. 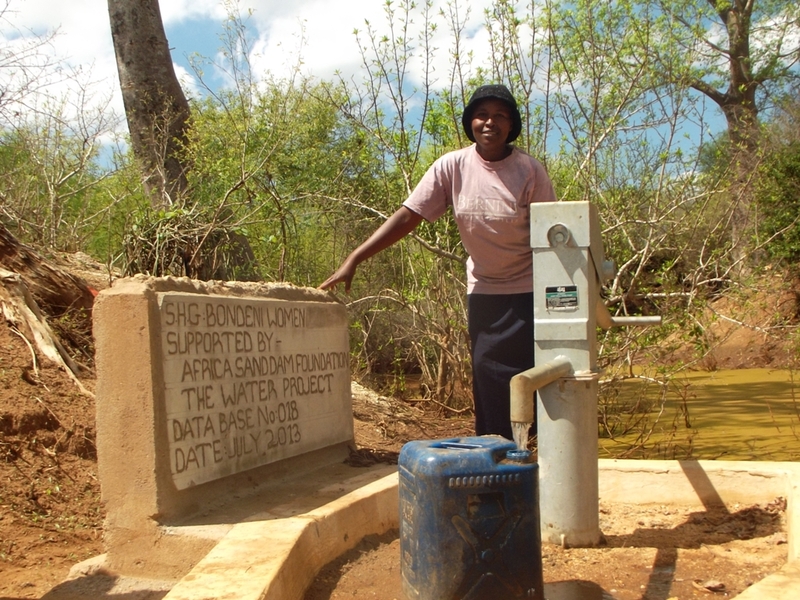 The main water sources in the area are shallow well at Nzwii 1 and shallow well at Ilingoni. 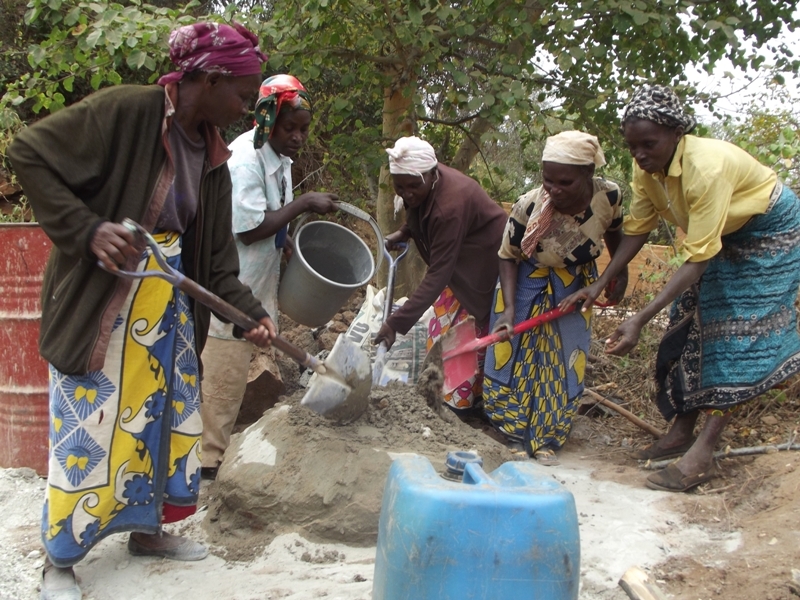 The shallow wells are situated less than 1 kilometre away from the community. 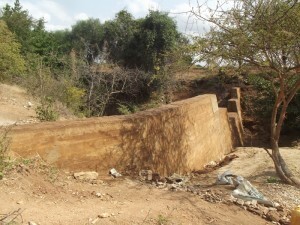 The shallow wells are owned by the community members. 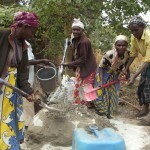 During the dry season ones takes 2 hours to fetch water from the shallow well. 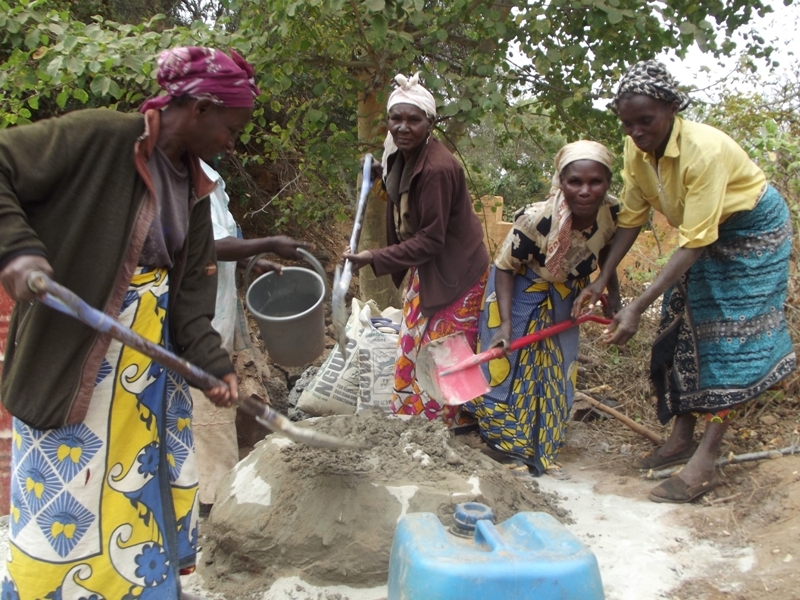 The reason why they spend more hours is because the shallow wells have little water during the dry season and also the water sources are strained by a large population in the area. 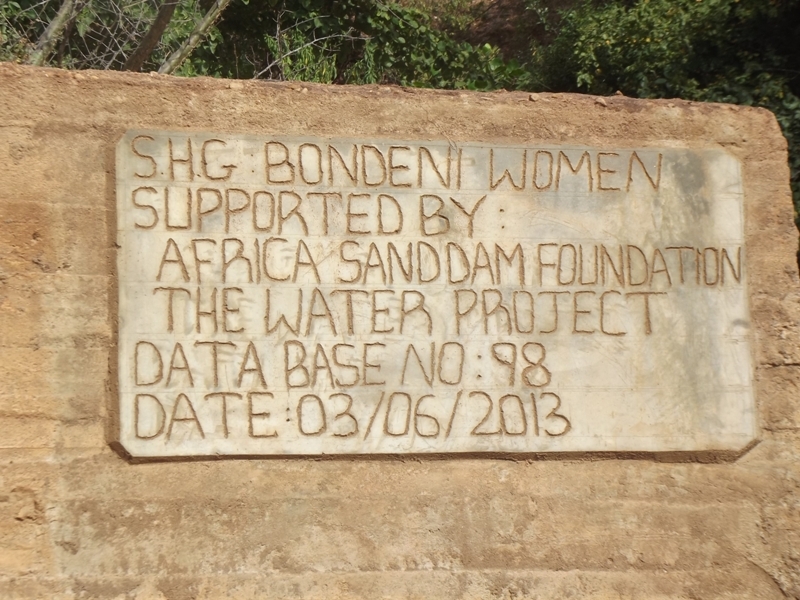 The members contribute kshs. 50 monthly to pay the person who takes care of shallow well. 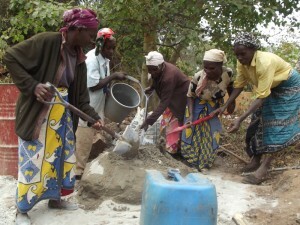 Women and children bear the burden of fetching water. 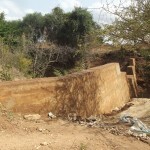 In the dry season there is rationing of water due low water levels of the shallow wells. 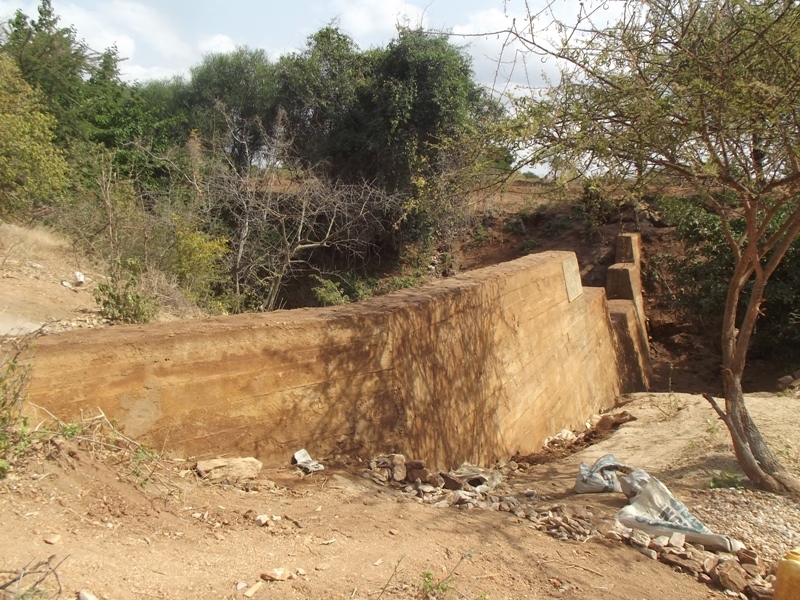 The shallow wells are opened at 6.00a.m and closed at 9.00a.m thus they can recharge .During this period only one is allowed to fetch 4 jerricans of 20litres thus the water is not enough for domestic use. Also the water is saline from the saline. 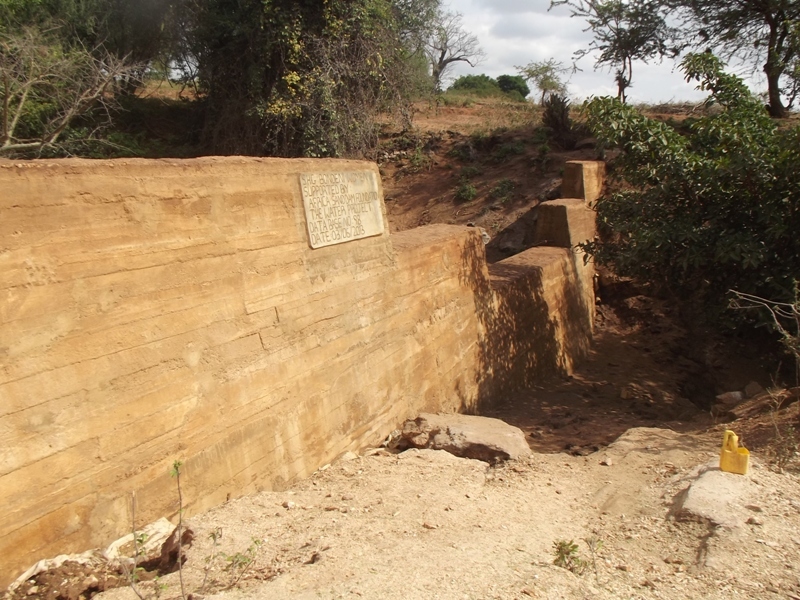 The other alternative source is Nzambani water pipeline which not reliable due to frequent break down and the nearest kiosk is more than 3 kilometres from the members. The tree planting has been affected. The lack of water has led to drying up of the trees that the farmers plant. Their livestock experience water shortage problem during the dry season because they do not get enough water for drinking hence affecting their health. Poor rainfall. For over the last four years more so we have been experiencing low rainfall in the area hence having poor harvest. Last season they did not harvest anything. Poor farming practices. Most of the farmers do not use manure on there because they have few livestock to produce the manure or do not have the money to purchase it. 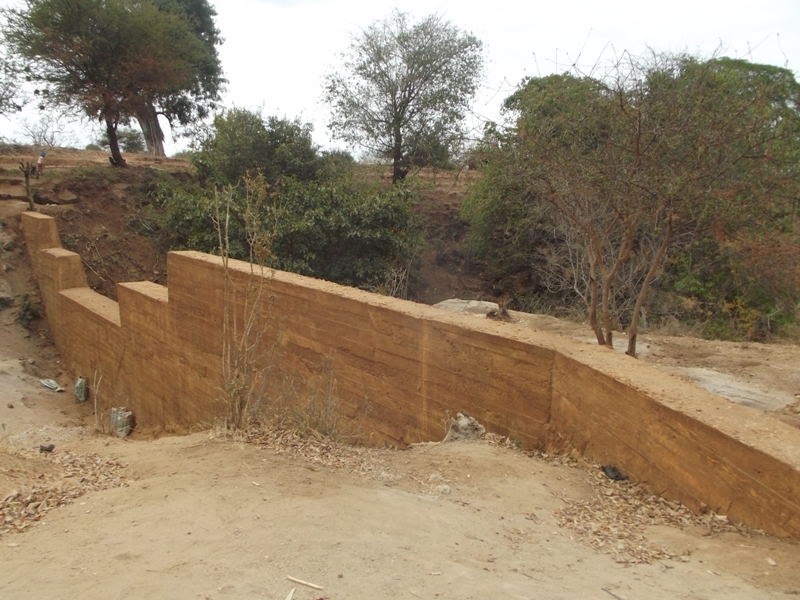 Also the terraces are of low standard because washed away by rain water hence degrading soil quality in our farms. The group seeks to start a tree planting program. 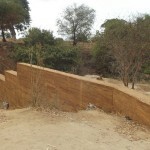 However the termite infestation and water problem has been a challenge in the area. Also they lack knowledge and skills on tree planting. 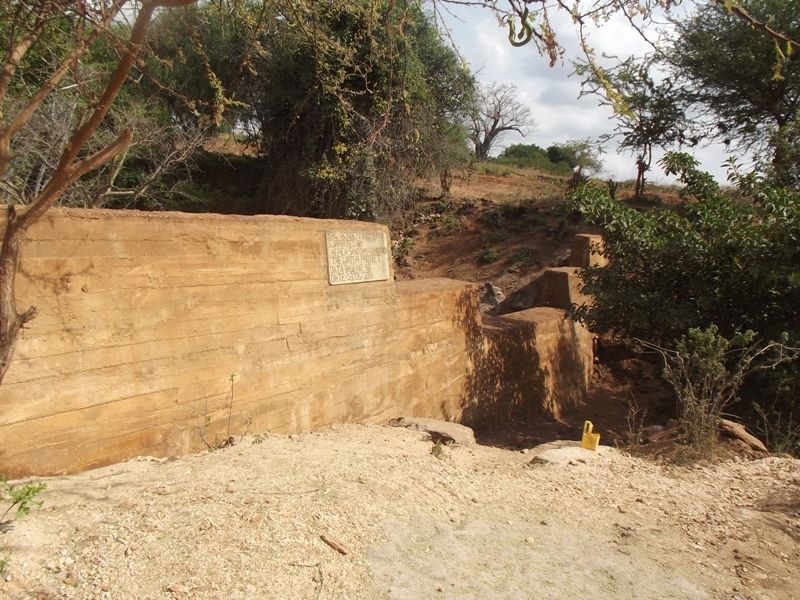 The community seeks to create water security through building of sand dams. 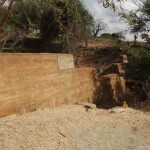 With sand dams they will alternative source of income because they rely on rain fed agriculture. 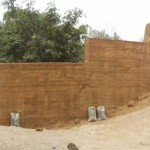 They want to be supported with farm tools which they will use for terracing which will in turn improve their harvest. Also they seek to increase their knowledge on farming practices which has been one of the challenges to improved harvest. 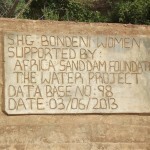 Bondeni self help group was formed in the year 2011 by a group of 15 women. 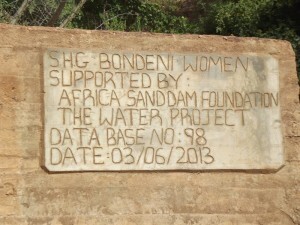 “Traditionally its women who suffer from fetching water. 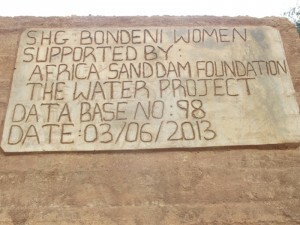 We saw how our neighbors had benefited from sand dam projects and decided to come together to implement the projects,” says a member of the group. ASDF has supported the women to learn tree planting skills as well as the positive environmental of planting those trees. 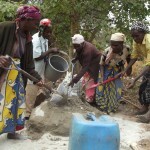 They have also learned about environmental conservation and soil conservation through terrace digging. 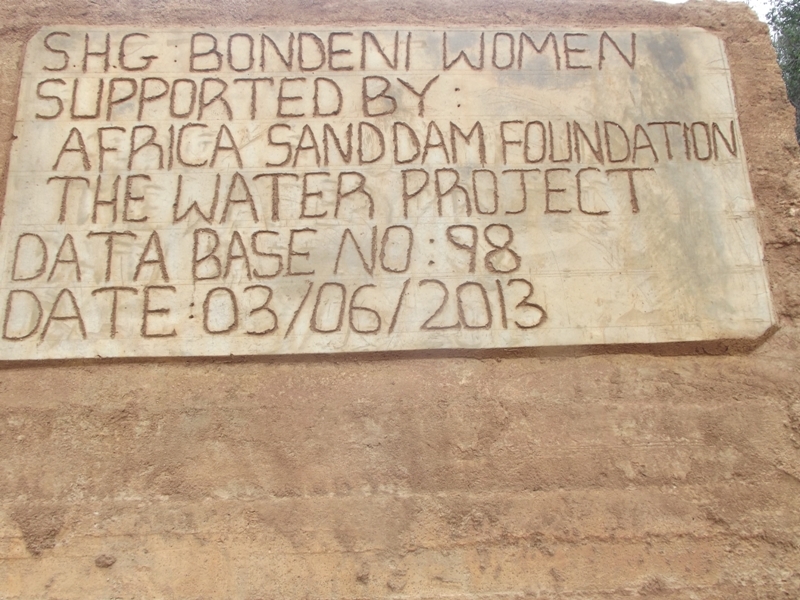 The Water Project funded the construction of the first sand dam and water well for the community. 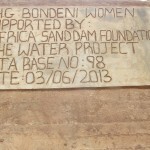 The sand dam started May 13 2013 ended 4th June 2013. The main challenges were poor turn out of members at various instances (due to other obligations not out of apathy). 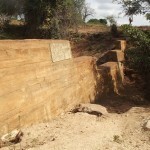 The excavation of bedrock proved to be more difficult than originally thought and the price of buying water for the construction process was also more expensive than originally budgeted for. 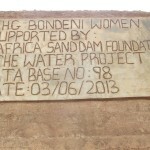 Biweeekly Construction Progress for Bondeni Women Self Help Group Shallow Well. The excavation started on June 2013. The construction started on July 10 and ended 10 August 2013. Current status is complete. 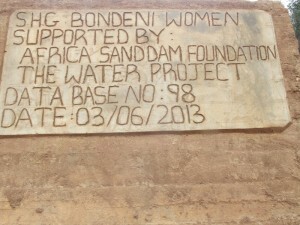 The main challenge was the in kind contribution from the community. 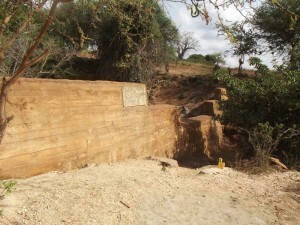 The excavation of the shallow well had a higher cost per foot, at ksh 2000. 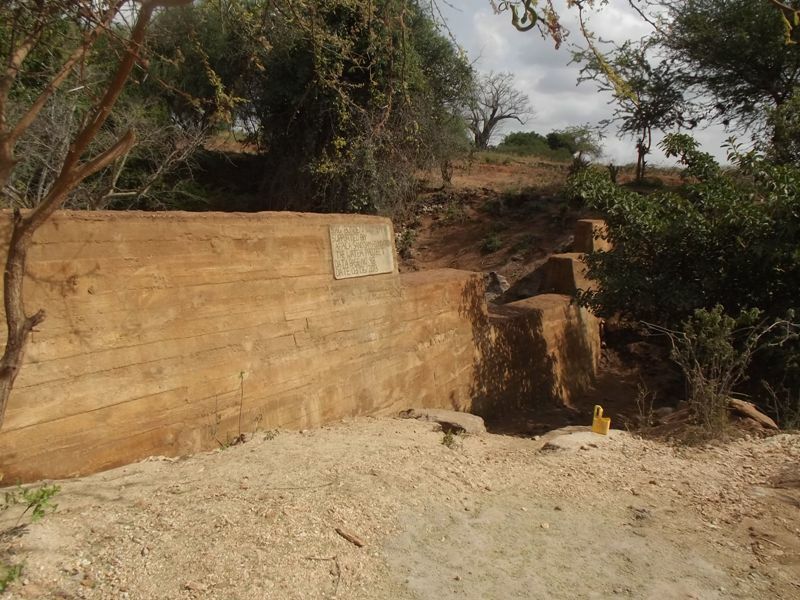 (approximately 18$) They community therefore had to spend almost Ksh 40,000 (approximately 265 USD) for excavation. 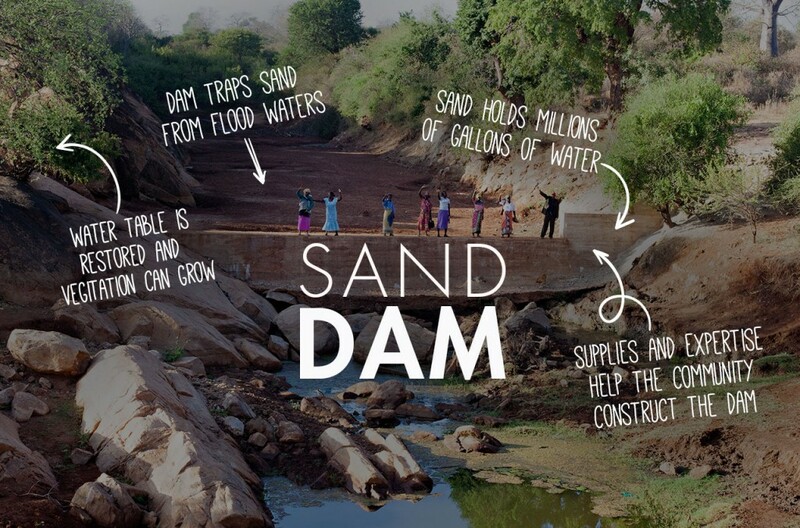 For most communities this is way above what they can afford, but with combined efforts they managed as they knew the return would be much greater than the investment and that in time they would be an abundance of water to improve their lives. Construction is complete, but change is only beginning for this community. 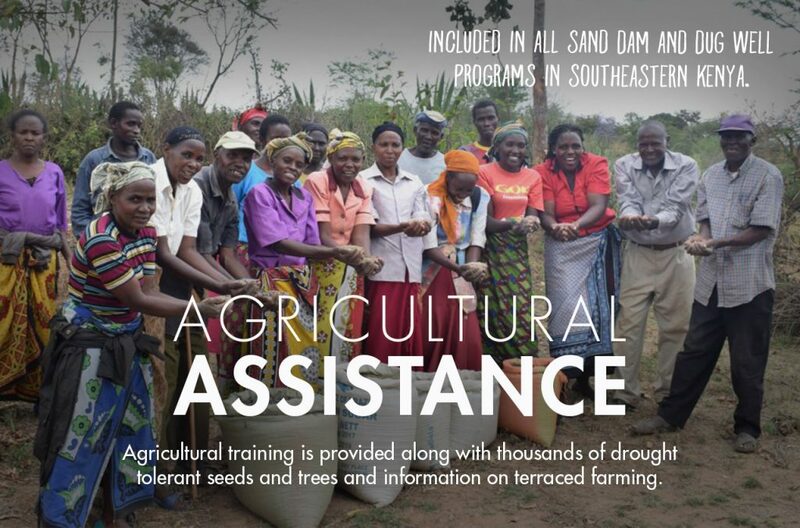 Our partner will continue to work with them to develop proper sanitation and hygiene practices and farming techniques. We’ll keep you posted as the progress continues.